VT102 Terminal Emulation • ZOC: A modern VT102 terminal for Windows and macOS. ZOC Terminal is a powerful terminal emulator offering an industrial strength implementation of the VT100 and VT102-emulations, which lets you access a variety of servers via telnet or secure shell (SSL/SSH) connections. Overview: Servers are central computers that can be located anywhere in the world. To use or maintain them, they need to be accessed through so-called dumb terminals or thin clients or PCs running a terminal emulation, e.g. VT102, VT220 or xterm. The VT102 terminals originate in past when DEC was a major manufacturer of mainframe computers and when VT102 terminals were used to access these servers. Nowadays terminals are emulated (simulated) by software, hence software that takes the function of those VT102 terminals is now called a VT102 emulator. 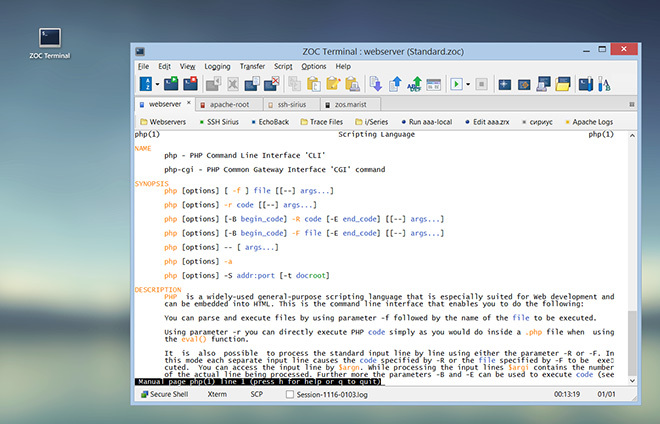 Such software (like ZOC Terminal) is available on Windows or macOS and other operating systems. In computing, a DEC VT102 (or DEC VT100, which is nearly the same) is a pretty reliable standard terminal type for access to a variety of computer systems. VT100 and VT102 were introduced in 1978 by DEC, a former competitor of IBM and maker of computer equipment and mainframe computers. It was originally sold as a physical stand-alone terminal for the VAX mainframes. In the past (before the PC), a VT100/VT102 terminal was to be a device consisting of a physical screen and keyboard. The terminal was connected to a central server and provided a user with the means to enter data into the server and see results that the server sent back to the user's screen. Thus the users had (rather inexpensive) terminals on their desk to provide them with shared access to a (prohibitively expensive) central computer. However, with todays PCs, the use of a single purpose screen and keyboard to access a server has become an outdated concept. Instead, these days a program on a PC can, emulate (simulate) the functions of a VT102 terminal. A software that does this, is called a terminal emulator. As all terminal types, VT102 is a standard that allows the server to send text to the user's screen. By embedding special controls in the text, rather than just displaying text from left to right and top to bottom, these codes also allow control over the placement and display charachacteristics (location, color, etc.) of the text. E.g. in order to send the text "This is an error!" to the user's screen with the word "error" highlighted, the host would send This is an ^[1merror^[0m! to the VT100 or VT102 terminal. Rather than displaying all the text, the VT100 or VT102 terminal will interpret ^[1m and ^[0m as commands that tell it to highlight the text that is received between them. A fulll list of terminal emulation sequences for vt102 can be found in the VT102 User Guide on vt100.net. The quality of a terminal emulator can be measured by testing how fully it implements the terminal emulation sequences (see above) and how closely its matches the original terminal's behavior in borderline situations (i.e. when it receives unexpected, faulty or weird combinations of sequences). Vttest is an application that is used to demonstrate features of VT100 and related terminals, or emulations thereof, such as xterm. The program was originally written in 1986 by Per Lindberg. ZOC has been tested using the vttest suite, based on a test score developed by Columbia University. ZOC Terminal has scored an excellent 105 Points (see the full report), which ranks it among the best in the industry. Today most 'terminals' are simply a software running on a PC. But many standard telnet clients can be used to emulate VT102 terminals in a basic way, but lack support for certain subtleties in the way true VT102 terminals handled the incoming data. Essentially, the basics of VT102 are easy to implement, which is why it is supported in most terminal software to some extent, but the subtleties are hard to get right. ZOC however is different, it lets you access mainframes via a telnet or SSL/SSH connection using an expertly built VT102 emulation. Additionally ZOC supports a wide scale of other emulations used in the Unix world, like Linux, xterm, VT220, TN3270, TN5250, Wyse, QNX, etc.